Every year we go on a camping over the summer school holiday. We're not the "return to the same place year after year" type of campers as we want to explore and discover new places. 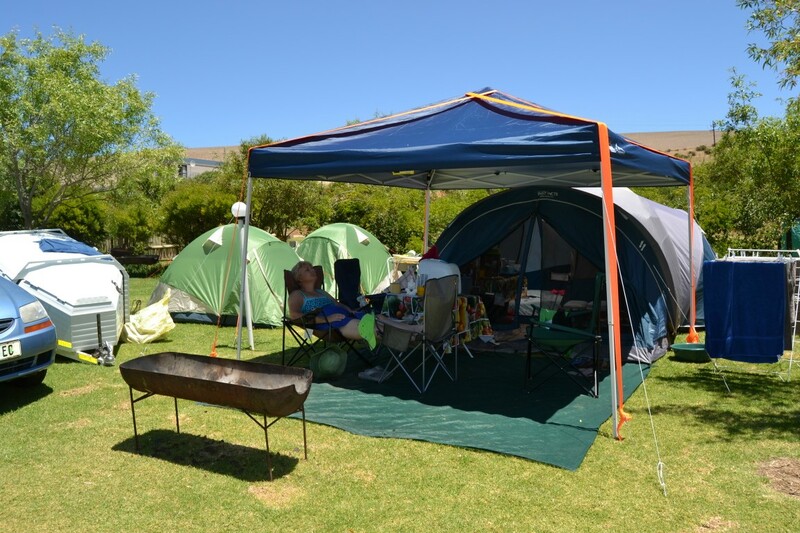 As we live in Port Elizabeth and by the sea, we're also not bothered by coastal holidays which tends to be windy in summer and effects us badly as we camp in tents. 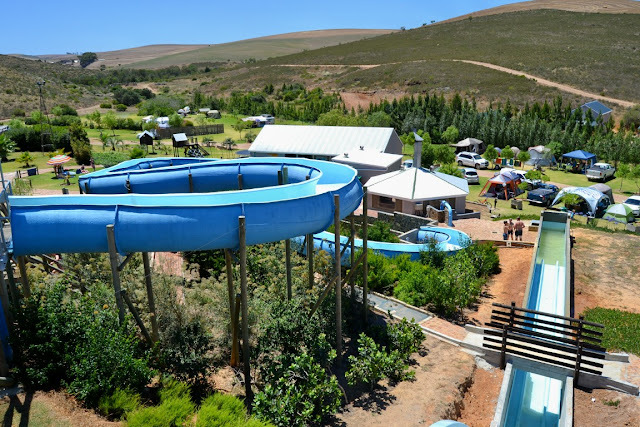 After a lot of searching and researching, we settled on Vloedbos in the Overberg as our destination for December 2015. 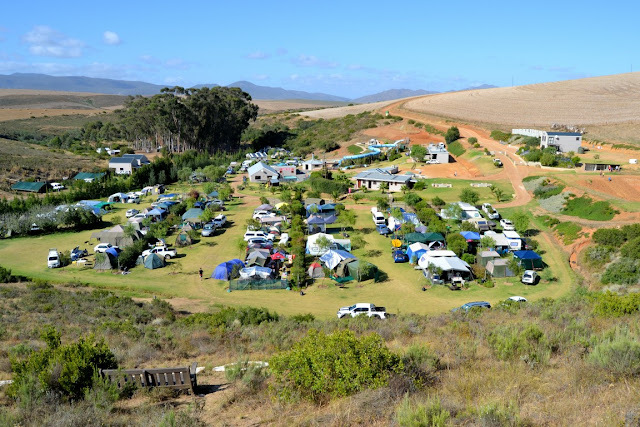 And there, just off the cross roads between Riviersonderend, Caledon, Hermanus and Napier, we discovered a true camping oasis between all the brown summer fields of the Overberg. 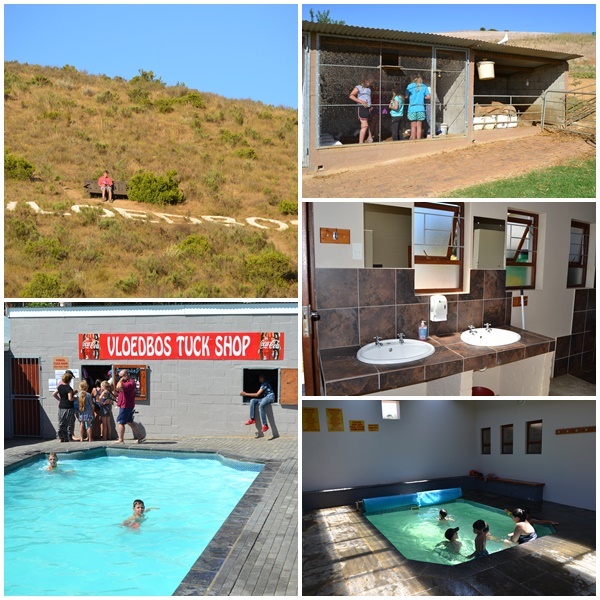 Vloedbos, with its 46 caravan and camping sites (all on lush green grass) and a number of self catering accommodation options, belongs to the Du Toit family and is truly a family run resort aimed at families. We were made to feel very welcome from day one and I barely started pitching the tents when the KidZ disappeared to go and explore everything Vloedbos had to offer. 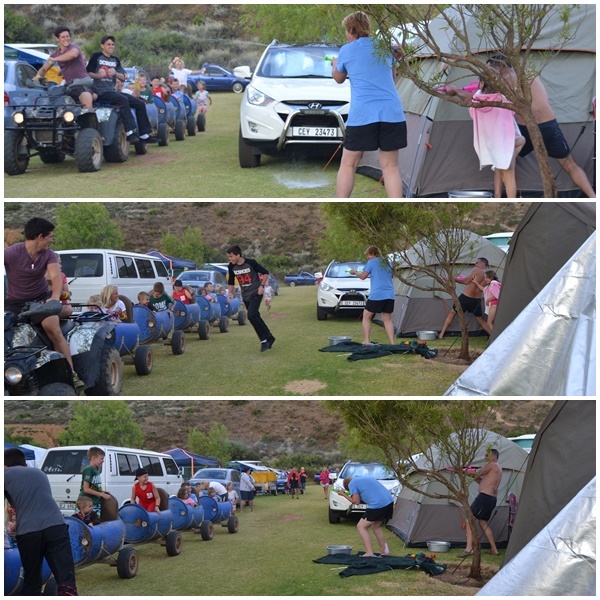 While the KidZ checked out the activities, the Damselfly headed over to the ablution facilities as that is generally her first "tongtippietoets" to see if she's going to be happy at a campsite. She actually came back to interrupt my solo pitching effort and made me go and check out the excellent bathroom facilities before I could get back to setting up camp. One of my most important tests of any campsite, especially if it is some distance from the nearest shop - like this one is - is the resort's shop. 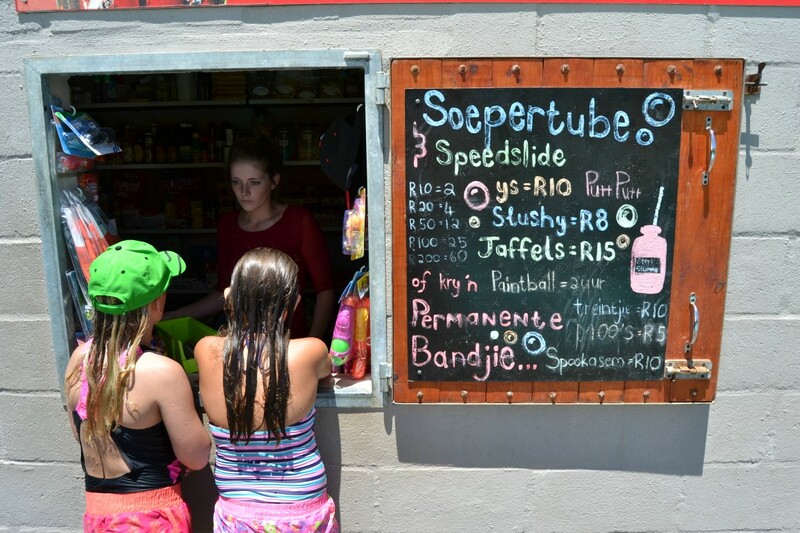 The Vloedbos Tuck Shop did not disappoint. It was well stocked with just about everything one needs with the only thing we suddenly needed and couldn't find there being cinnamon for pancakes. Demichelle offered to get it for us by the next day which was excellent, although we decided to make a quick trip to Napier (and sommer do a couple of Geocaches while we were there). The other very notable thing about the shop is that the prices isn't a ripoff like I have so often seen in campsite shops. I wonder how much we spent on ice creams while we were there for our 10 days? The biiiiiiig attraction for young - and old - is the super tube and speed slide. 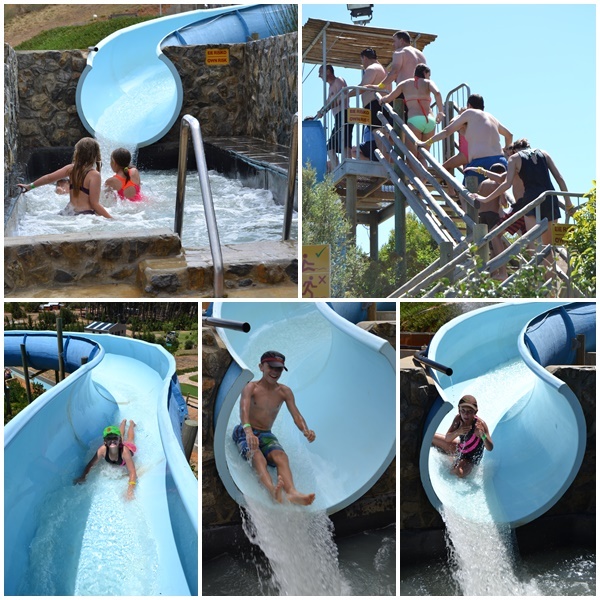 The slide is open daily from 10 am to 12 pm, 2 pm to 4 pm and a final hour between 5 pm and 6. They use a siren to announce the super tube opening and you can be sure that every time that siren went off it was a case of towels being grabbed (and sometimes forgotten) and kids scattering and racing to make the most of their time on the tube. I have to be honest here though and say that perhaps my biggest complaint during our stay was the cost of the super tube. At R5 per ride or R100 per day it does work out a very expensive exercise to have two KidZ and one dad who wanted to ride every day. 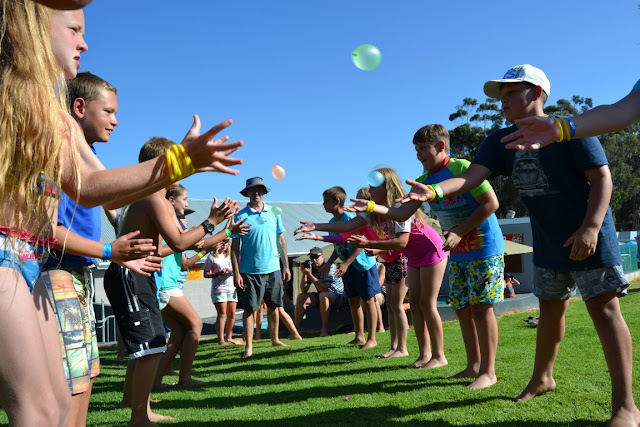 I tried to explain to the KidZ though that they had to keep in mind that most of the other campers came from Cape Town and only had to drive 2 hours to get there while we had an eight hour drive each way which costs a lot more in petrol. This meant that they had more money available for their kids to ride more often. At least my KidZ understand things like that and I am proud of them for doing so. We made a deal with the KidZ that they could each get a full day ticket and that we would buy them a couple of loose riding bands for the other days. They also used some of their own money to fill in some blanks. This meant that there were on the super tube every day. Some days more than others. I had my full day as well and believe me, I got my money's worth. I did realise though that I'm not 25 anymore and my body really knew I was on there for most of the day. In actual fact, I out-rode most of the children that day. The speed slide isn't for everybody although I really enjoyed it. I think the strangest thing of our whole stay was the fact that the Damselfly preferred the speed slide over the super tube. Yes, that's her in the top three pictures and bottom left. The best of all was her first ride. She got to the top and stopped, allowing a few kids to pass her while she gathered her courage. I heard a comment from a boy standing next to me that this aunty is going to scream when she goes down. Well, he was slightly disappointed as she didn't utter a peep. Even I was surprised at that. 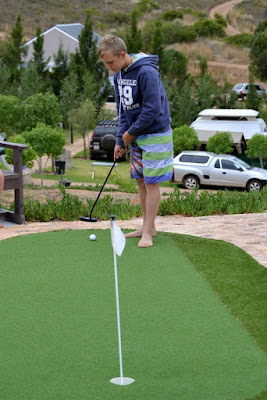 Vloedbos' brand new 13 hole mini golf course also saw a lot of action from us while we were there. 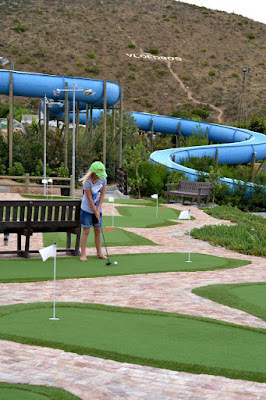 We used to play putt putt a lot more when we were young than what today's children get to so the KidZ made sure they utilised the course every opportunity they got. Pssst, let me tell you a little secret. Hire your clubs and balls during the last one hour before the shop closes and they allow you to keep it till they open at ten the next day. You can play all evening under the floodlights and perhaps have a quick round the next morning as well. You can thank me later. 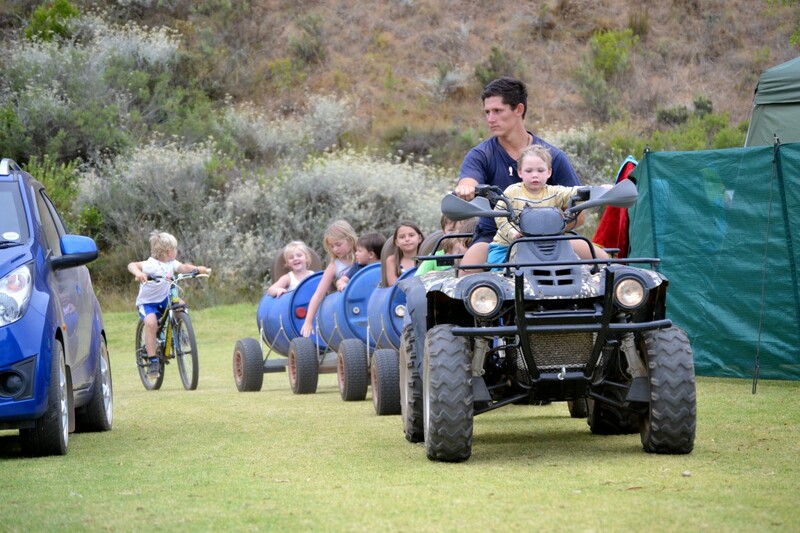 A big highlight for the littlies every day is Carlo and the quad train. Ten bucks and the train takes them on snaking route through the whole campsite with bicycles and runners following behind. One afternoon the campers two tents down from us ambushed the train with water guns. After the ambush the train stayed away for a long time before suddenly appearing again. I immediately spotted that something was up. 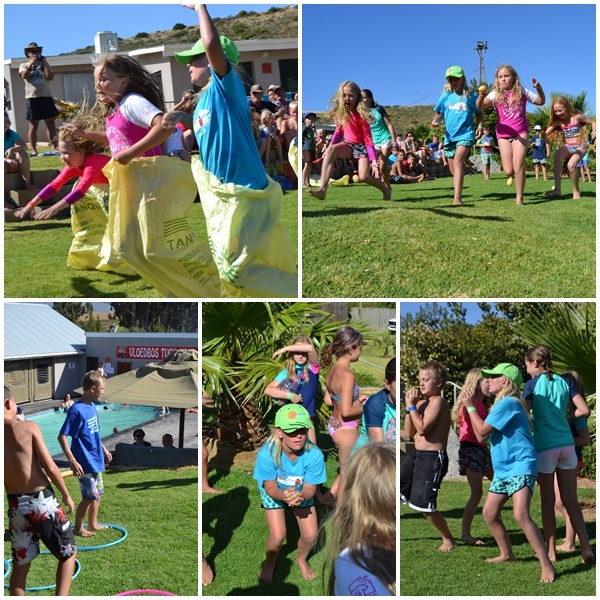 The kids all had big smiles and at closer inspection noticed hidden water guns and water balloons. They were ready for a second possible ambush. I ran to grab the camera as I knew the ambush was indeed on again. There were lots of screams and laughs from both sides as the first water balloons started flying. Now this is the kind of campsite fun non-campers will never get. The holiday program, although very limited, was a lot of fun for the kids as well. We unfortunately only stayed till just after Christmas so ended up missing out on a lot of the activities they offered. If Drama Princess was a member of the Spice Girls she would have been Sporty Spice. And that showed at the holiday program. She was in with a shot in each item she participated in, nearly out throw and catching the boys in the water balloon challenge. Even Chaos Boy participated in the activities for a change. During our stay he didn't really make a bunch of friends like Drama Princess did, but he was never bored. As for the Damselfly and myself, we just used the holiday to chill. I promised myself that I would try not to thing of work during my holiday for a change and I didn't. I binge read under my gazebo, went for walks, swam when I wanted, visited with other campers, played with the KidZ and just did nothing. In fact, I grabbed a second book just before we left home in case I finished my first one. I was done with both in five days. 'Nuff said. 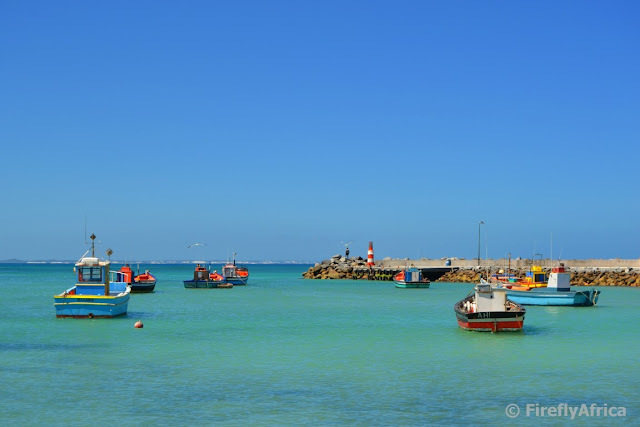 We also spent a day exploring the Overberg coast between Gansbaai and Agulhas, something we really needed more time for. But relaxing was the first priority. My impressions of Vloedbos? Well, if you haven't been able to gather that we were suitably impressed from everything above, here it is again. It is a great campsite. Beautiful grassy sites even if there isn't that much shade yet. Excellent facilities. Well looked after with hands on management. Strict rules about noise. Very child friendly with lots to do for the whole family. Would perhaps liked the wifi to have worked better. Yes, I wanted to see what the world was up to on social media. Vloedbos is the ideal campsite for a weekend camping getaway from Cape Town and perfect for a longer holiday. It really is a shame that we are so far otherwise we would have visited more often. Although most of the visitors were from the Western Cape, I'm sure they will get more and more popular with visitors from further off as word about them gets out more. Will we be back? 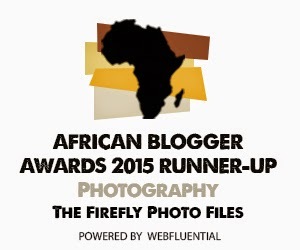 I sure would like to return some time, but for December 2016 the Drakensburg is a calling. 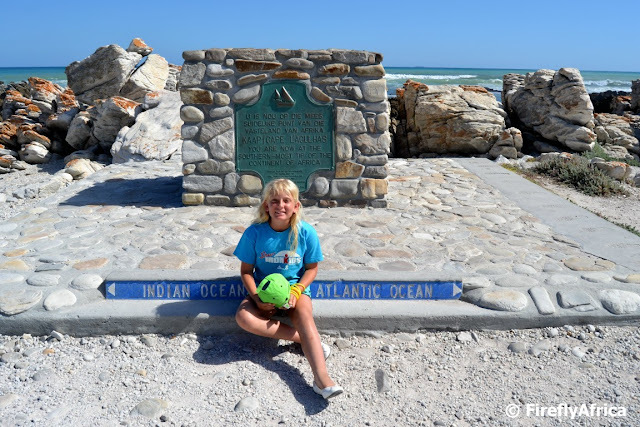 I have finally had the opportunity to take the family to see Cape Agulhas. I got to visit it the first time when I was doing my tourist guide training for the Western Cape but as a family we have never been in the area. A day of exploring along the coast took us from Gansbaai past Danger Point to Struisbaai and Agulhas. It took us a lot longer to make the journey than initially expected and the family already started grumbling about heading back to the campsite at Vloedbos so I decided to rather skip climbing the Agulhas Lighthouse. At least I've been up before and the family got to climb Danger Point. I did stop to get a couple of photos of the lighthouse though. 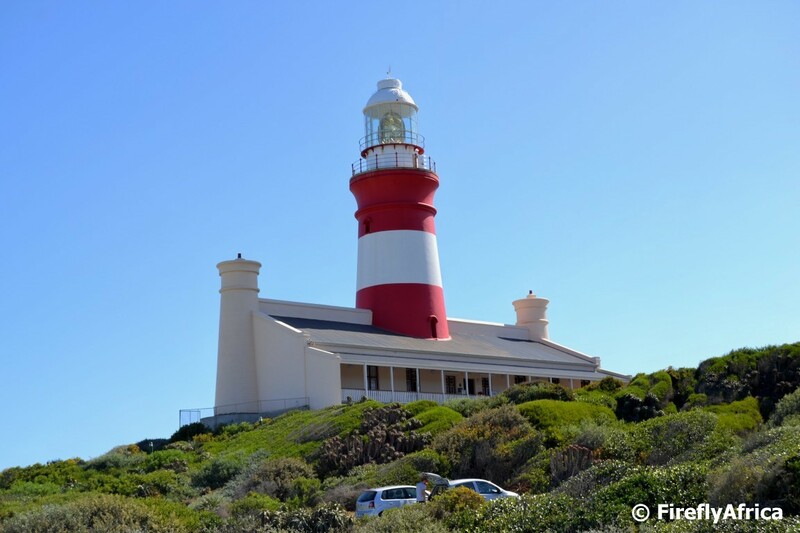 The Cape Agulhas Lighthouse was opened in 1849 and was the third lighthouse to be built in South Africa. Today it is the second-oldest still operating after Green Point. The design of the building was inspired by the Pharos of Alexandria, one of the original 7 Ancient Wonders of the World. In 1968 the lighthouse was taken out of service when it was discovered that the sandstone walls were crumbling due to excessive weathering. The light was moved to an aluminium tower and restoration started on the lighthouse building with it being recommissioned in 1988. From the lighthouse it's a short drive to the parking area from where we followed a boardwalk to Cape Agulhas. 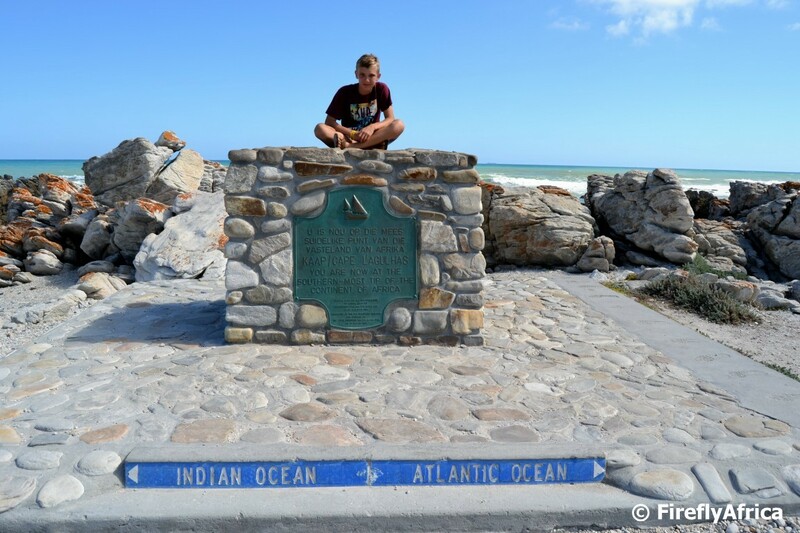 Cape Agulhas is significant as it is the most Southern point of Africa and officially the spot where the Indian and Atlantic Oceans meet (no matter what some Cape Townians would like you to believe about Cape Point). 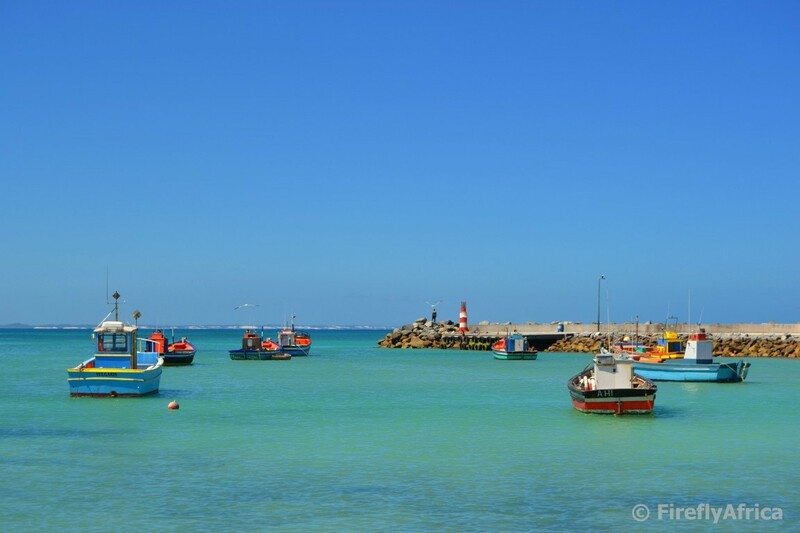 The cape was named by Portuguese navigators around the year 1500 who called it Cabo das Agulhas, Portuguese for "Cape of Needles", after they noticed that the direction of magnetic north (and therefore the compass needle) coincided with true north in the region. Chaos Boy who was the most excited about seeing the most Southern point was rather disappointed what what he saw when we got there. 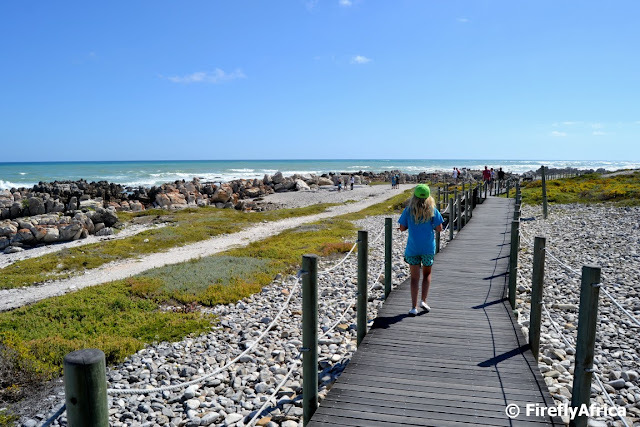 Cape Agulhas is relatively unspectacular with a gradually curving coastline and a rocky beach. To be honest, if it wasn't for the small stone monument and plaque, one would probably not even know that you are actually standing at the cape. The significance isn't lost on you when you are there though and we joined the other tourists in a line for our turn to take photos. Drama Princess wasn't really bothered about the cape, although she had to pose for a picture as well. She was more worried about finding one of the oldest Geocaches in South Africa nearby. Something we did afterwards by the way. Cape Agulhas may not be as spectacular as Cape Point but it's still very cool to be able to say one has stood at the most Southern point of Africa. 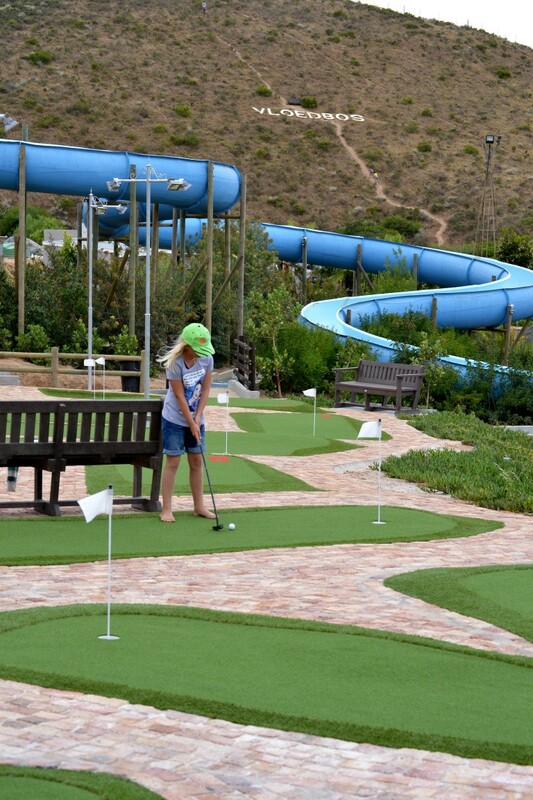 The Sundays River Valley and Addo is synonymous with the Addo Elephant National Park and have never really been a holiday destination unless you went to visit the Addo Park. But this has all changed. 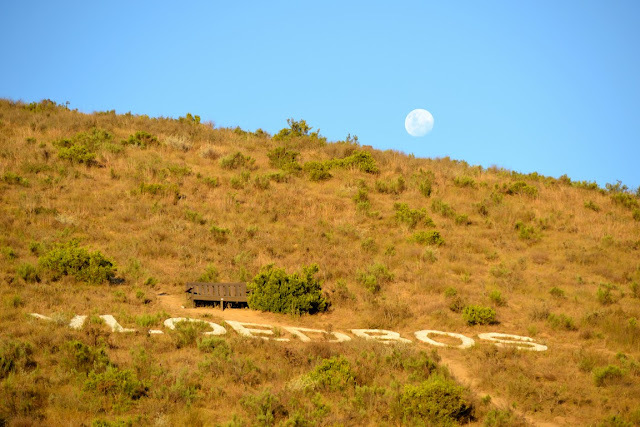 The Addo area is about so much more than just elephants these days. It has actually developed into a holiday destination all on its own. Addo and its elephants are still the big attraction, but the area around the park has also turned into an adventure and activity mecca. Zip lining, ferry cruises, sand boarding, quad biking, horse riding and more. 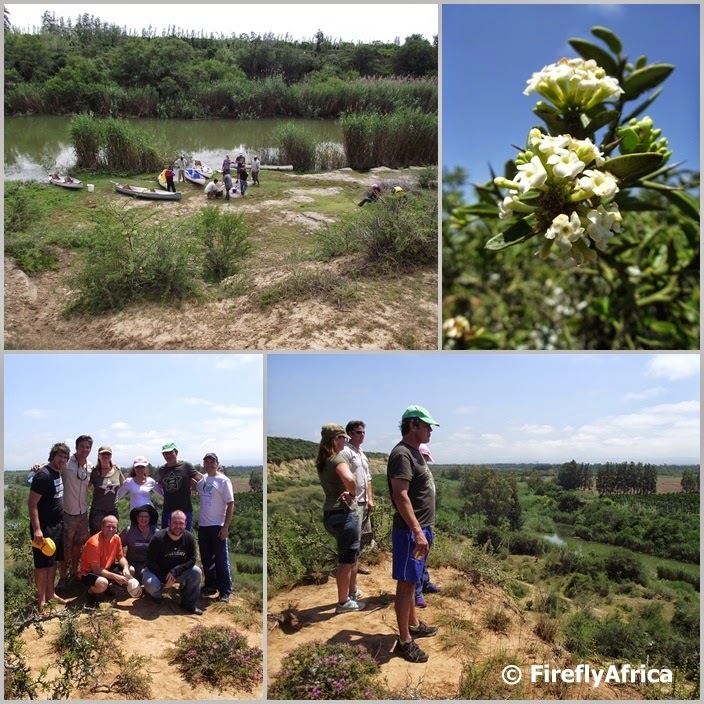 One of the more, and one that should be on your to do list, is Crisscross Adventures' Addo River Safari. Some time ago, and I'm sorry but I uploaded the photos and never did the post, I got to join a number of journalists on a media trip with Chris Pickles and his team down the Sundays River. We got picked up from our guesthouse and transferred to the starting point where we got giver the obligatory safety briefing. Life jackets got dished out to those who didn't feel that comfortable on the water and we were paired up for our journey down the Sundays. My paddling partner was worried about not having paddled before, but Chris reassured us all that paddling experience wasn't a prerequisite to go on the trip. Turned out her was right, obviously, as stretches of flat calm pools were narrower channels with faster flowing water. Never did we see water even hinting at a thought of turning white so this really is for everybody. 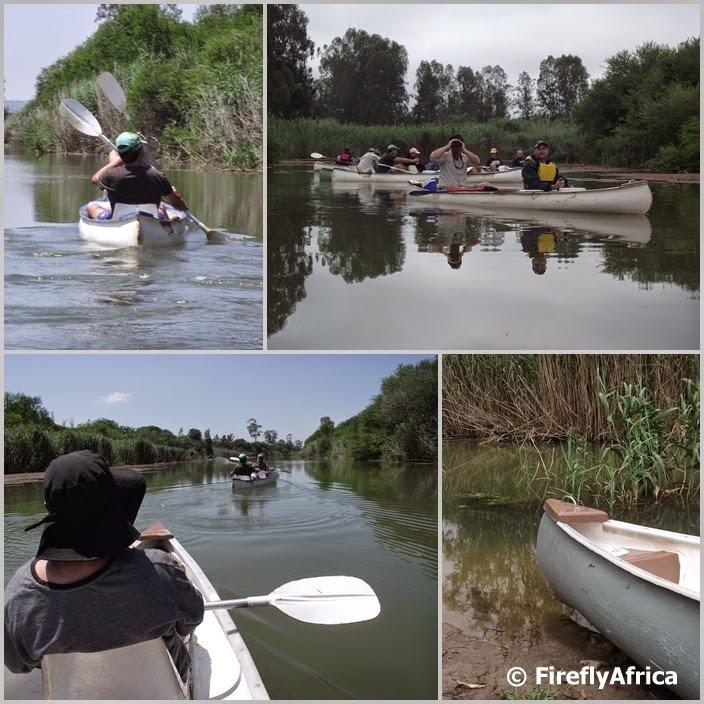 Our three hour gentle paddle down the Sundays River was one of beautiful scenery, sightings of birds, flowers, plants and even a water monitor dashing off into the reeds at our approach. Two thirds along the way we stopped for refreshments and a walk up to a lookout spot over the surrounding valley with the river below while Chris showed us a couple of plants and told us some of the area's history. From here we were back in the water for the last stretch down the river to the pickup point. 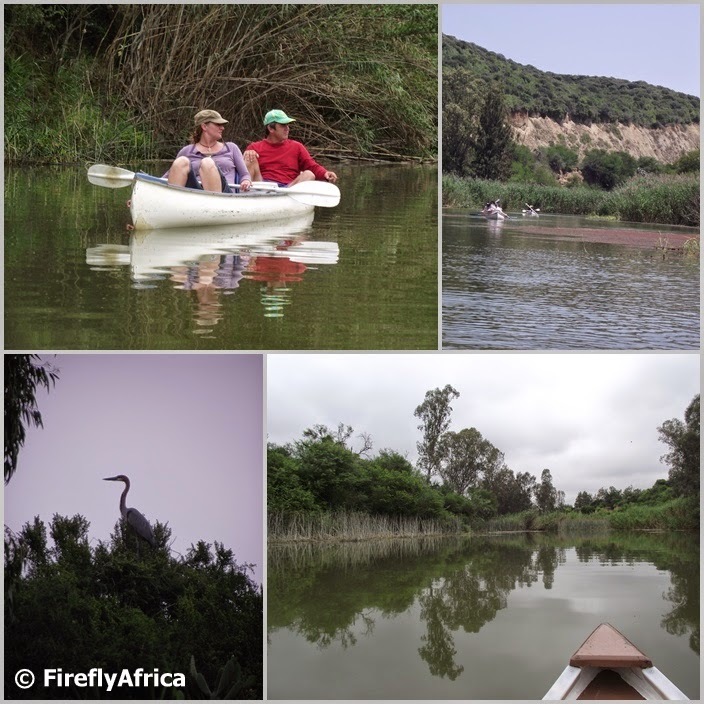 The river safari really is for anybody who enjoys the outdoors and is keen to do something new. The canoes are like flight deck ships and won't capsize. The only difference though is that these canoes are easier to control and handle than a ship loaded with war planes. Other than being splashed by you and your partner's paddles, you won't get wet, but the canoes do have water tight container for you to put your camera in if you want to take one. Photo opportunities there are lots. Just a pity I was to slow to get my camera out for the water monitor. Disclosure: I got to go on the Addo River Safari courtesy of Crisscross Adventures. I received no further remuneration, wasn't asked to write a positive post and keep full editorial control.